The climb of Butter Tubs will be better known once the first stage of next year’s Tour de France passes over it. How hard the riders find it will depend a lot on the wind. Yesterday, damp and blustery with the wind at my back, I barely noticed it, the gradient never so steep as to force deep effort. But at over 500 metres, conditions towards the top can be dreadful; I’ve been brought almost to a standstill by head winds here, and felt my bike being blown beneath me by side winds. The Butter Tubs themselves lie just over the pass from Wensleydale to Swaledale; this is limestone country and the Tubs are deep potholes set close to the road, used – legend has it – for keeping butter cool. From the little market town of Hawes in Wensleydale you can see the Butter Tubs road climbing north over the moor; disconcertingly, the road seems to be clinging to the fellside for dear life. Out of Hawes and across the River Ure, you wind up past the hamlet of Simonstone. Below you upland rain pummels down through Hardraw Force, England’s highest unbroken waterfall. There’s a short, steep section (where the biggest crowds, including me and my family, will gather on the first Saturday of next July) before the road relaxes its way across higher ground. And this is a road, not a lane. I guess it was chosen partly because it stays so wide as it goes so high. Coming half-way through the stage, it’s unlikely to make much impact on the race – chances are a break (hopefully including a Brit, even a local, or two) will have formed, and the peloton will mind the gap before reeling it back for a bunch sprint to the Harrogate finish. But what impact might the Tour’s passing through this part of the world have on cycling more generally? I love cycling’s continuing high profile. I try to keep it in perspective – for most people cycling continues to be mainly irrelevant – but after a lifetime spent loving something strange I’m starting to feel a bit more normal! Still, imagining we’re in the midst of ‘a cycling revolution’ is wishful thinking and for the Tour de France to have local impact on everyday life in the Yorkshire Dales – and so contribute to a nascent trend of ‘Britain embracing the bicycle’ – requires work. Revolutions never happen; they’re made. Can almost 200 of the world’s strongest male cyclists passing over Butter Tubs help get Yorkshire cycling? Can the spectacle be turned to participation? And the participation not just of cycling enthusiasts drawn to Yorkshire’s hills and dales, however good that might be for the tourist economy, but also of local people going about their daily business? Put differently, can carbon-heavy cycling – for Le Tour is certainly that – be converted to carbon-neutral cycling? Because only cycling which replaces rather than adds to carbon-based travel will help move us towards sustainability; and no matter how many good things bringing Le Tour here might achieve, that’s – surely – what matters most. From Butter Tubs the road drops into Swaledale; it’s steep with some tight corners, but remains wide and is surprisingly well surfaced (although it’ll probably need re-doing after another Yorkshire winter); unless it’s particularly wet and windy, the Tour carnival will hurtle down without a second thought. 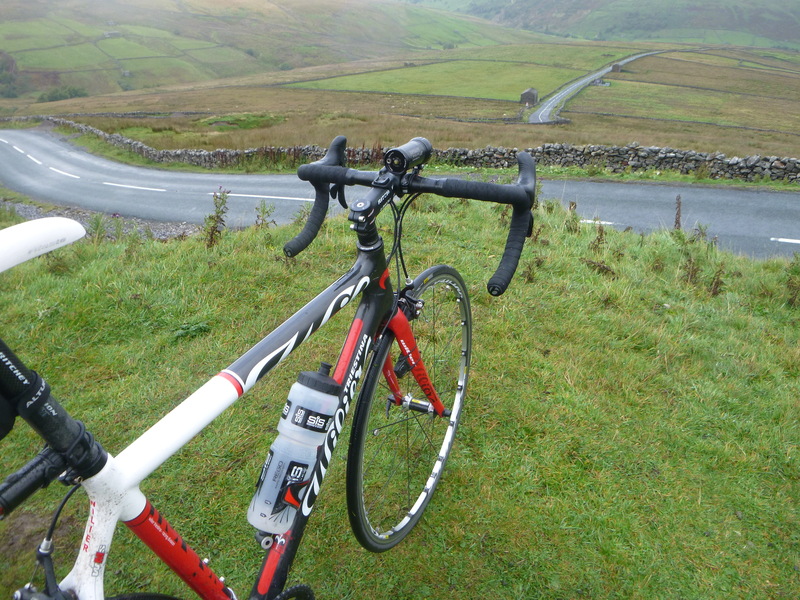 You can’t talk about Yorkshire cycling without mentioning hills, wind and rain. Cosy in a car, you’re immune to all three, but on a bicycle it’s a different story. So is cycling here only for the fit and adventurous riding just for fun, never for ‘ordinary people’ doing ‘ordinary stuff’? Will Le Tour’s legacy be more ‘outsiders’ coming to ride in Yorkshire, while locals stay stuck fast in their cars? Hay barns dotted prettily across its floor, upper Swaledale is gorgeous. 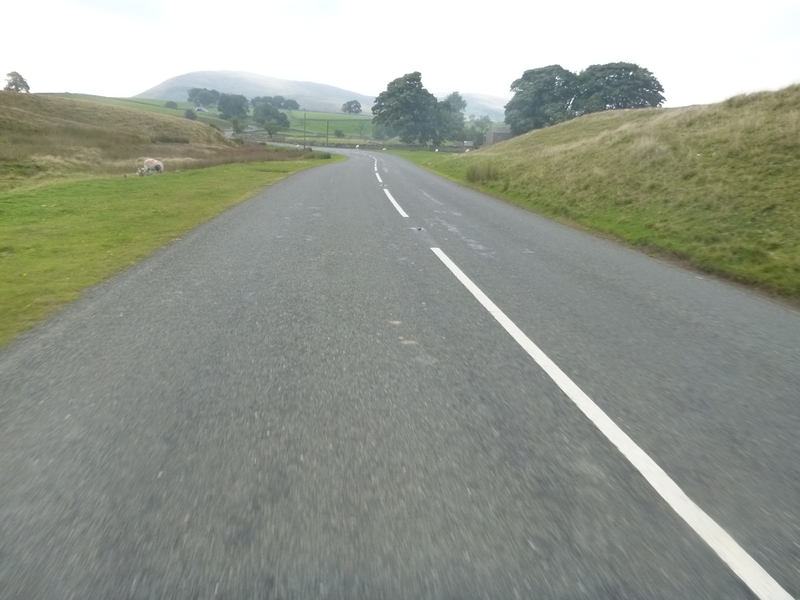 Here I turn left – my route takes me to the top of the valley and the Cumbrian border on the wild and windswept Birkdale Common, but all the riders and the fuss will turn the other way, through Muker and Reeth, before crossing back to Wensleydale down at Leyburn. Yorkshire is talking of Le Tour. For people here there’s no escape. So what to make of it? 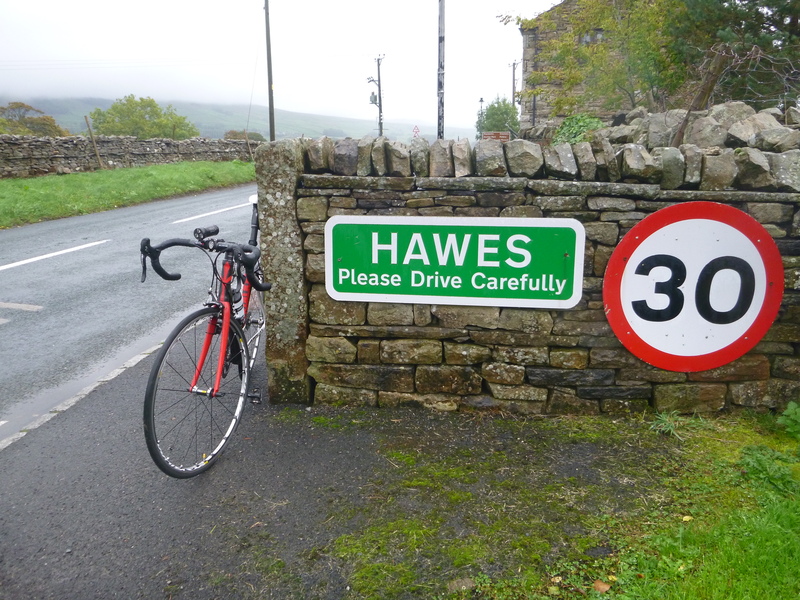 In a place like Hawes cars are everywhere, and the people you occasionally see on bikes look much like me. The car enables life here to continue to be lived as it’s come – if only in quite recent times – to be lived; everyday life without a car has quickly become unthinkable. Is, then, re-thinking the bicycle as able to do some of the work which the car currently does in places such as this too big a challenge? If so, would that be a failure of cycling, or of our imaginations? Yorkshire’s landscapes and people will next year add colour and character to the world’s biggest bike race. But how will the race leave Yorkshire? Essentially unchanged beyond a momentary tourist boom and a contribution to re-making the region as a cycling destination? Or can it leave a longer-lasting and more locally-relevant legacy, developing the region not just as a destination for, but also an origin of, cycling? We’re seeing some money to get people living in cities cycling, and also visitors to national parks. For sure we need new thinking and ideas to help make it happen, but we could also now do with some money to help people who actually live and work in places like Yorkshire’s Dales cycle too. The 2014 Tour won’t by itself make much difference; but we can make it make a difference. So I suggest we find ways to use the Tour’s Yorkshire passing as an impetus to develop a rural cycling which doesn’t disappear once the race is gone, but survives locally and contributes to sustainability. There are parts of England, never mind Britain, where it’s possible to do a long day’s ride almost entirely on A and B roads (for those who live elsewhere, that’s big roads) yet rarely see a truck or car (though tractors, quad bikes and post vans are a bit more common). I’d been invited to the Department for Transport’s Cycle Stakeholder Forum which took place on Monday in London. Although on paper I’m a ‘member’ of this Forum, I’ve yet to attend a meeting. Frankly, the continuing ‘taking cycling seriously’ waffle, whilst so little’s being done to make cycling easy, makes me nauseous, and whilst I know it’s not a particularly rational political strategy (and even ‘immature’), I increasingly want nothing to do with it. To be honest I’m still not sure whether ‘men (and it is mainly men) in suits (pretending to) take cycling seriously’ is a good thing: it’s probably an inevitable and necessary stage in the process of making cycling mainstream, something I’ve long hoped to see; but – and this is where the nausea comes in – I hate seeing cycling instrumentalised, reduced and bureaucratised, all so it makes sense within worlds which – at least for me – are antithetical to what cycling is and should be. So rather than go to London I promised myself a long ride instead. Then I’d save the £90 train fare, and likely spend and end the day energised and elated, rather than dejected and deflated. Some days all I want to do, really, is sit on the bike and ride; spend the day thoughtlessly pedalling. On those days I tend to devise a relatively flat route along relatively big roads (and I almost always ride anti-clockwise, a habit I developed long ago – I think through riding with people who saw right turns as making rides unnecessarily complicated). With so much talk of ‘Getting Britain Cycling’, it’s odd that I can leave home at 9 am on a Monday morning, ride 85 miles along big roads remarkably free of motorised traffic and passing through some of England’s finest countryside, yet barely see another person on a bicycle. We might be getting more serious about more effectively inserting cycling into the ‘straight’ world, but what I’d like to see is the ‘straight’ world get a bit less, well, ‘straight’ through its embrace of cycling, so that the Monday-Friday, 9-5 grind starts to lose its allure. ‘Yes’, cycling could make us ‘more efficient workers’ (one of the few reasons many politicians could probably be persuaded to like it), but really, who wants to be a more efficient worker?! Instead, sell the car, get a bike, and use the money saved to drop hours spent working and go cycling instead! That way lies more health benefits than ‘merely’ pedalling the commute could ever bring; and a tangible sense of freedom to boot. Rides such as this one, involving big loops north-east of Lancaster, don’t feel they’ve quite started until I reach Ingleton, 18 miles from home. I think that’s because only then do I reach roads that are wide, open and quiet; until then bigger roads are busy, while quieter ones are lanes that tend to feel intimate, not expansive. 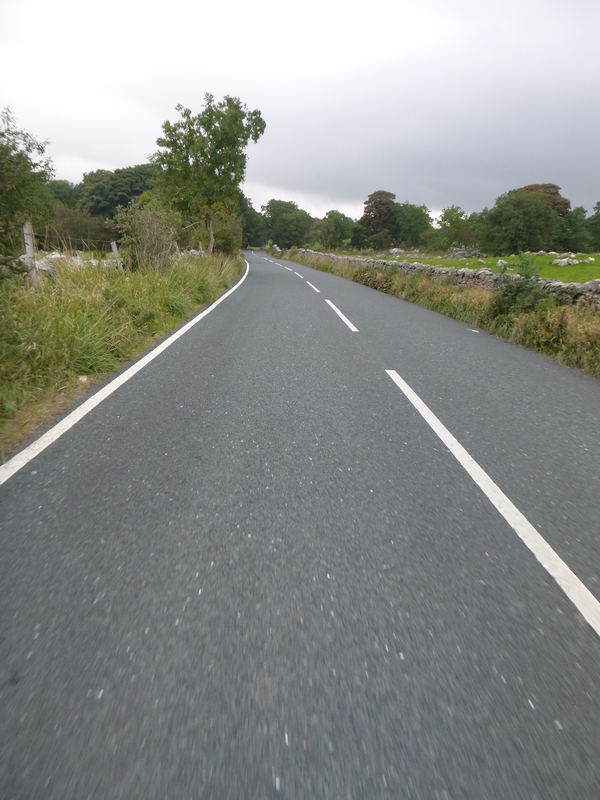 I love riding through the gentle mid-morning ‘bustle’ of Ingleton village (I often pop my first banana or energy bar on my way through), because then the ‘niggly bit’ is over and the long, straight roads of the western Dales begin. 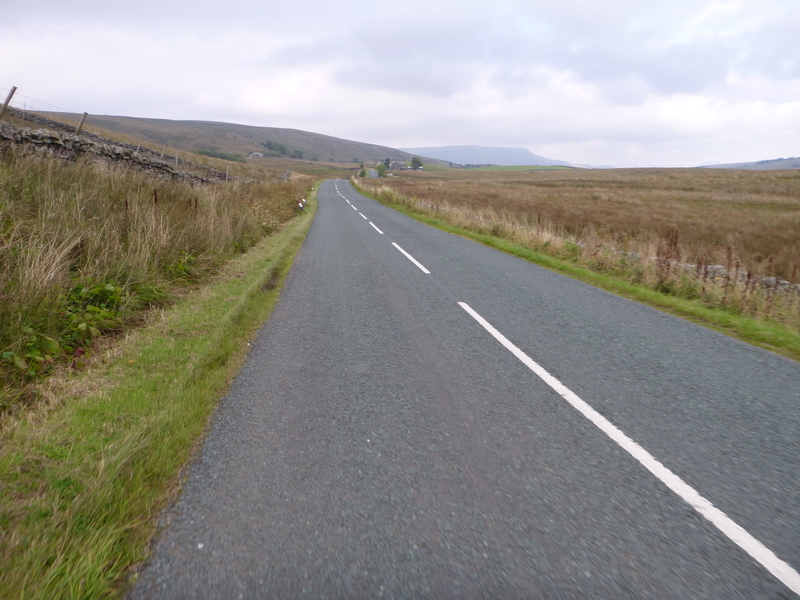 The B6255 road to Hawes climbs steeply at first before flattening as it strikes a course north-east, Whernside to one side, Ingleborough the other. Riding this road I always feel a deep privilege to being on a bike. The valley narrows towards Chapel-le-Dale and the exposed limestone creeps closer, then Ribblehead Viaduct strikes its clear, fine line across the moor ahead. You swoop fast down beneath it and then, immediately after the Horton turn which follows the Settle-Carlisle south, there’s a lovely curve to the road which lets you keep your speed ahead of the next rise, as you pass the motorists huddled in their cars. From the pass at Newby Head it’s downhill almost all the way to Hawes. The road is wide and its gradient gradual, so you can hold a good speed, with on Monday a strong head wind saving me the effort of braking. From Hawes the wind is mostly at my back, and I plain sail west up valley to the Moorcock Inn, just shy of the Wensleydale/Garsdale watershed, turning north there down a valley for which, if I’ve not ridden it in more than a month or two, I develop serious cravings – Mallerstang. Why do I love Mallerstang? The gradients are gentle (you can see why the Settle-Carlisle railway took this valley), and – in this direction – after a short climb you’ve a long downhill that’s fast and fluid. The surrounding fells (Wild Boar is perhaps best known) are little visited, while their long edges and gentle slopes form a perfect fit with road cycling. And though you’re moving fast across smooth tarmac, you feel here that you’ve left the world behind. I usually stay along this Eden Valley into Kirkby Stephen because, 50 miles from home, I need food; but today – progress slowed by the wind – I’ve already eaten in Hawes. So at Pendragon Castle a few miles short of Kirkby I take the little lane west (the railway tunnelled below) to the next empty A road, the 683. A super road, going south it aims straight at the Howgills before hugging tight their eastern flank. (You re-enter the Yorkshire Dales National Park where Cautley Spout tumbles from the fells behind The Cross Keys Temperance Inn.) Like Mallerstang, heading this way the gradient’s in your favour and it’s another straight, fast run all the way to Sedbergh. Through the town I keep to the A683 along the Lune’s east side to Kirkby Lonsdale, switching there via Devil’s Bridge to the Lune’s west side for the last stretch, along the B6254, for home. Cycling wide open roads lifts not just my spirits but also my horizons. It makes me ambitious for cycling in ways not encouraged by the Department for Transport, ambitious not just quantitatively but also qualitatively. ‘Yes’ to more bums on saddles, but I want cycling to lead those bums – both individually and collectively – towards better things. Why ‘Get Britain Cycling’? To get its bodies and its cities primed for the next wave of neo-liberal, corporate, consumer capitalist incursions, aimed at making Britain more economically ‘efficient’ and profitable? Not in my name, thanks. I want Britain to ‘Get Cycling’ so more people might ride their bike to ride their bike and take ‘a cycling perspective’, one that gets them closer to home, closer to themselves, closer to a world in which no one need wear a suit. A strong westerly blew me out through Wray, Low Bentham and Ingleton, and up the Hawes road past Ribblehead viaduct to Newby Head Pass. 420 metres up, surrounded by windswept moor, this is the ride’s highest point. In bad weather it’s a slightly bleak and discomforting place. The moors seem to stretch forever in all directions but actually I’m about to drop steeply down. It’s another world below, and amazing the speed at which by bike you move between here and there; when the weather is wild (and it often is) to descend is to move from vulnerability to safety, but in any weather it’s to move from the remote and inhospitable to the cosy and familiar. The presence of even the smallest village is reassuring when cycling through less peopled places. These aren’t thoughts so much as moods, so fleeting I could almost miss them. They emerge then evaporate as I make my temporary place by pedalling through space. Neither thoughts nor moods settle; cycling bypasses psychology. A long ride especially squashes mulling and mithering, helping me dwell in a calmer place, to become a simpler being. It’s good for my mental health. 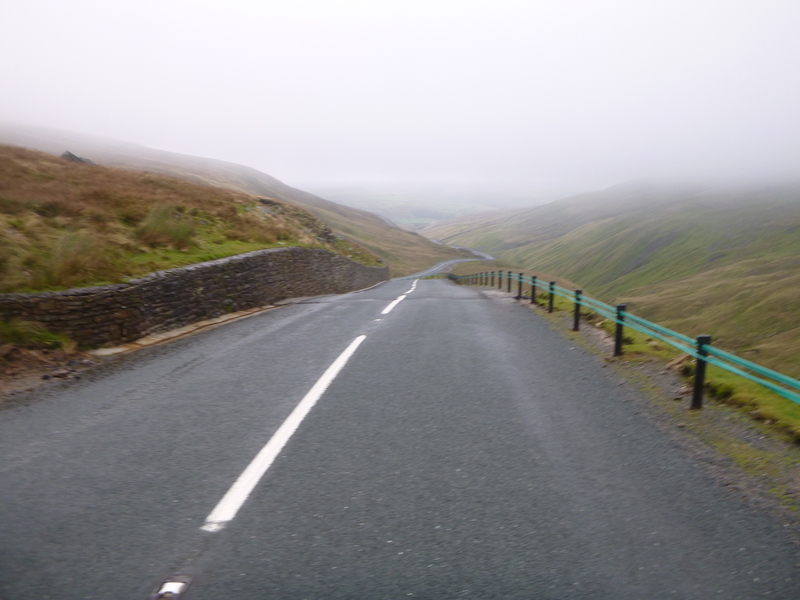 The best part of this ride starts at Newby Head Pass, with the turn onto the minor road into Dentdale. 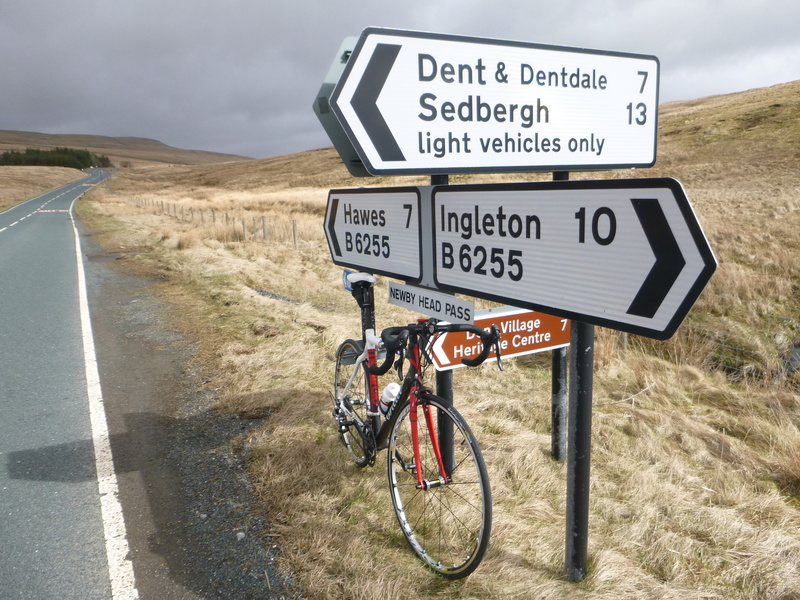 This is a ride within a ride really, pedalling Dentdale’s length. Although it’s a Yorkshire Dale, you enter Cumbria here. The lane undulates over the moor at first, then turns north-west and drops. The viaducts of the Settle-Carlisle railway appear below, then a short stretch of steep descent later their mighty arches rise dramatically above. You need to watch the road – this is an elemental place and rock, stone and wood mark water’s path across its surface. And like many roads round here it’s been gouged away by the long, hard winter. But especially when riding alone I crane my neck to witness the convoluted topography as it swiftly shifts from moor to dale. There’s no static point. Occasionally I make one by stopping for a photo, but this upsets the ideal cycling experience – cycling’s magic is the elimination of a fixed viewpoint, replaced by the fluid and continuous unfolding of the tight relationship between bike, body, road, land and air. Any ride can produce this experience but the stretch of road from Newby Head to Dent village six miles later is the best I know, and makes it one of my favourite rides. The railway pushes through the Dale’s head at about the height at which the many becks flowing from the surrounding fells form the River Dee. You’re properly in the Dale now, right next to the River. The road falls over the next few miles, as it skirts Whernside’s northern flank. You accelerate with the downward gradient into the most thrilling stretch. Your speed together with the need to focus on the road ahead means awareness of this magical place isn’t cognitively or even aesthetically felt. You become blurred with trees, water, rock and road. You lose, escape, who you are. This is surely cycling’s greatest pleasure – your own displacement. The River’s always different and often disappears beneath its limestone bed. In water’s absence you feel like the downward constant. You can ride this stretch slowly, but you lose something. From Cowgill lanes run either side the Dee. I cross a narrow, hump-backed stone bridge to ride the northern bank. At the junction here, the Coal Road north climbs out the valley past Dent Station, England’s highest, and over to Garsdale Head. The lane and river stay tight together for another mile before separating slightly just short of Dent village. In the six miles since the Dale’s head the road has dropped three hundred metres. The cobbles through Dent village form a stretch long enough to transport you briefly to Paris-Roubaix, yet are short enough to be pain-free. Rather than ride the Dale’s length I sometimes climb out just beyond Dent, from Gawthrop over to Barbondale. But this time I want to cross the last bridge over the River Dee, just before it flows into first the Rawthey and then the Lune. The lower Dale changes dramatically. It opens out and becomes more gentle. This change is geologically underpinned, the Yorkshire limestone of upper Dentdale giving way to Cumbrian rock. My riding style shifts according to these deep structures; I come off my drops and up to my hoods, my shoulder’s open, my gaze lifts; the intense riding of the upper Dale gives way to a broader, relaxed outlook. The lane gets bigger. The Dee no longer sticks rigidly to its side but moves away to become a more ordinary river. The road starts to rise as well as fall and for the first time since the Dale’s head I get out of the saddle and feel the miles accumulating in my legs. Just before the Dale’s end I drop to the Dee a final time, to cross to its south side via the slender bridge at Catholes. 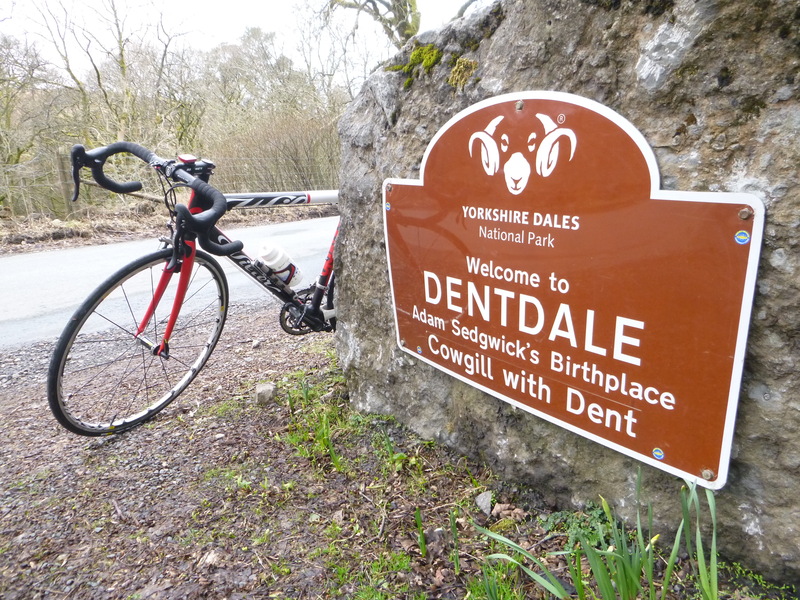 After twelve incredible miles I’m leaving Dentdale behind. I climb round Holme Fell and drop into the Lune Valley. From here it’s twenty-five fairly flat miles along the Lune back home to Lancaster. We spent the half-term holiday in the Yorkshire Dales. We began by taking the train to Giggleswick near Settle. 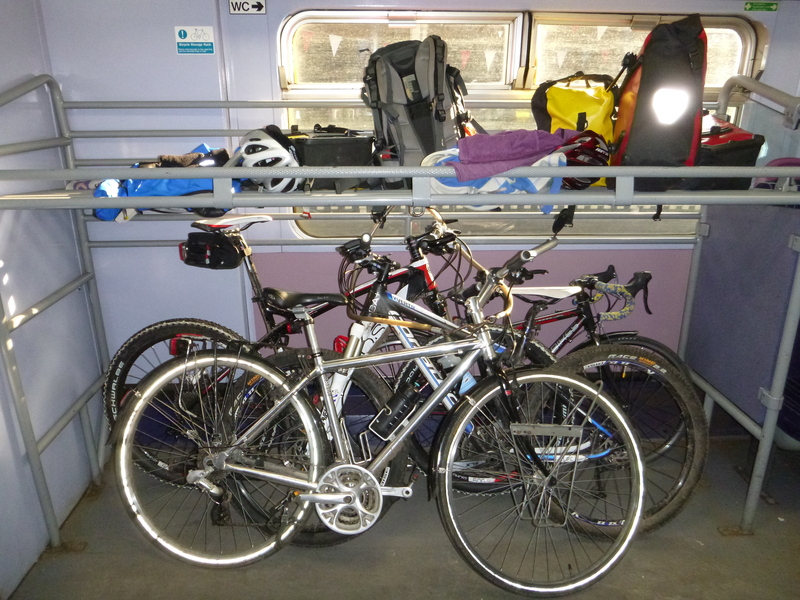 Travelling off-peak with children we hoped we’d get all four bikes onto one train and we did, both ways (though the uncertainties involved in train travel with bikes really aren’t conducive to cycling’s promotion). We’ve done lots of cycle-touring as a family, but this was the first time each of us rode our own bike for more than a day trip in Britain. We wanted to see how it’d go. It didn’t start well. A car approached from behind on the short stretch into Settle. I was riding at the back. We were getting close to a blind bend so I moved further out to deter the driver from overtaking, but he kept coming, so I kept moving out. He overtook at the bend’s apex, on completely the other side of the road as a car came towards us from the other direction. Rather than stop the overtaking driver moved back in on us, getting uncomfortably close to Sue and Bobby at the front. He must have seen the horror on the faces of the people in the oncoming car, and he should certainly have heard what I had to say, but still he wound his window down in order to tell us that cyclists oughtn’t to be in the middle of the road. Unfortunately we encountered similar recklessness towards our well-being and a similarly over-inflated sense of entitlement to Yorkshire’s rural roads amongst motorists again that day. I wonder whether local authorities in Yorkshire have started to think about driver/cyclist interactions ahead of next year’s Tour de France which will inevitably see cyclists flocking to this part of the world in advance of the pro peloton thundering its way through? I usually shrug off drivers’ aggression when I’m cycling alone or with my peers but when I’m with kids I’m incensed by it; it also seems more common then, perhaps because we’re riding more slowly and (the adults at least) defensively. That wasn’t at all what I meant to write here but I suppose it’s an important and consequential part of our half-term cycling story, and more significantly part of British cycling’s collective story. 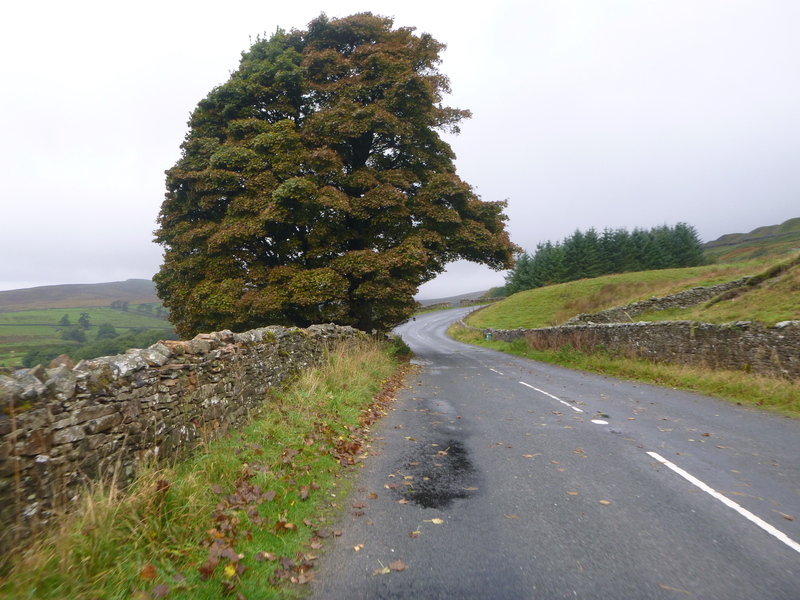 The Yorkshire Dales is tremendous cycling country, but for who? This was my own children’s introduction to it, and an antagonistic one which they’ll remember. Do we want the Tour’s coming here to encourage children’s cycling? If so, we need to take action. A start would be signs on the roads and in the media requesting motorists to slow down, give space – and if necessary give way – to cyclists. 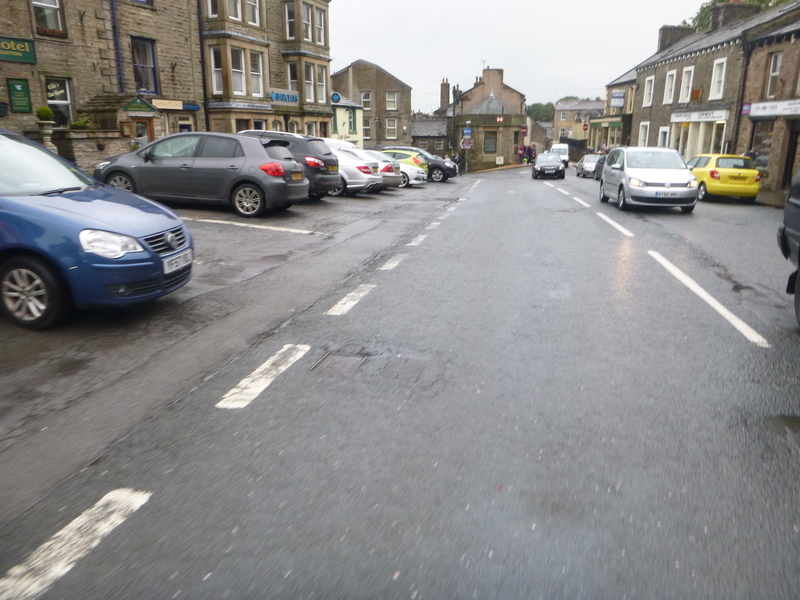 Awareness campaigns – perhaps with Dales’ school children who might most effectively influence adults’ driving – should start now. 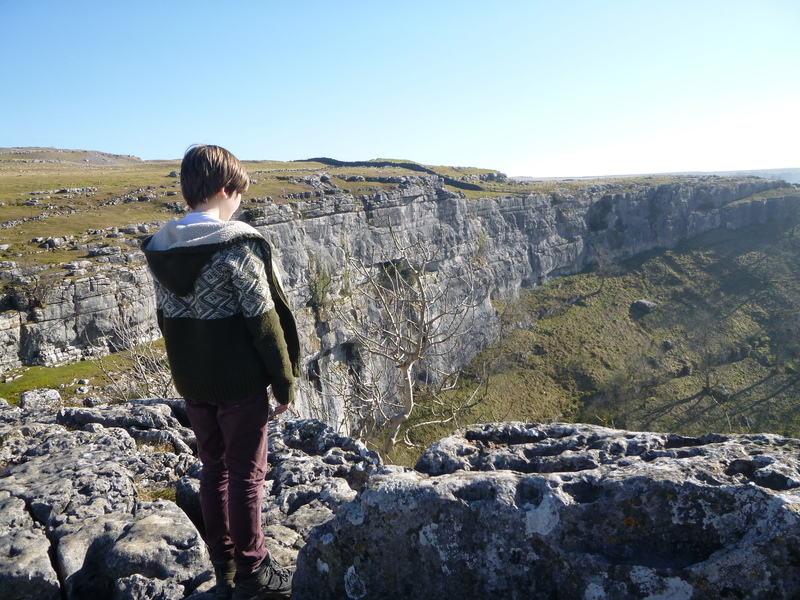 We went over to Malham from Ribblesdale. 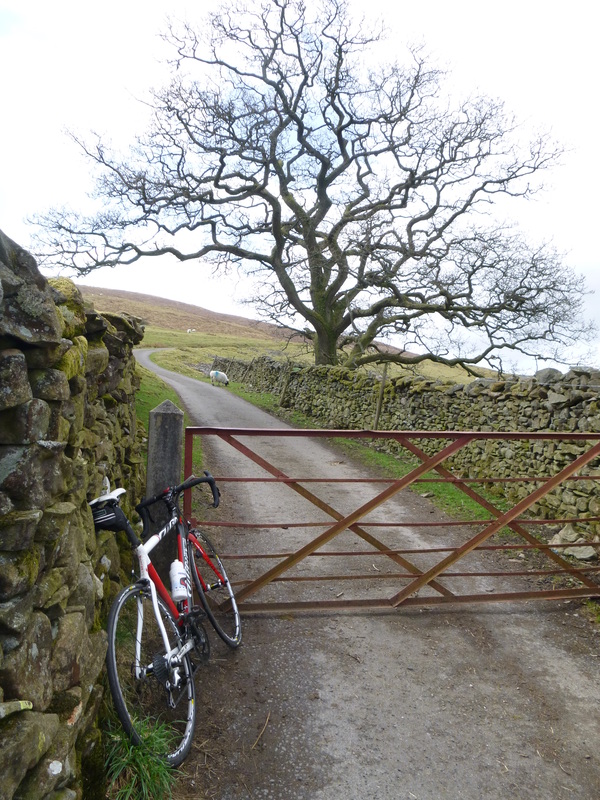 The climb out of Langcliffe is brutal; the road rises sharply and steeply off the valley floor. Bobby and I were on mountain bikes. Sue rode her town bike, and carried all our gear – I’d feel guilty if I didn’t know how hard she is! I doubted little Flo could make it up, but she did. She never seemed tempted to get off and push, despite (or perhaps because of) my repeatedly telling her there’s no shame in doing so. As usual we mixed cycling with walking. (What do families who do neither actually do?) 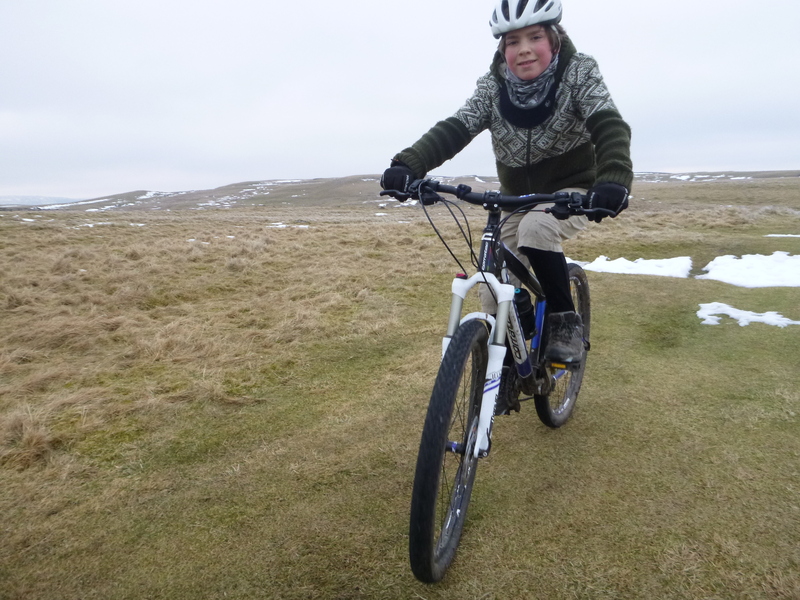 But Bobby and I had taken mountain bikes in order to do an off-road ride, so on Wednesday we rode into a bitterly cold wind east from Malhamdale over to Wharfedale. I’m already excited by the thought that next July the world’s best bike riders will be riding here. Past The Tennant Arms – the pub in Kilnsey where we stopped for bowls of chips and to warm ourselves beside the fire – they’ll scorch so fast it’ll barely register as a blur. 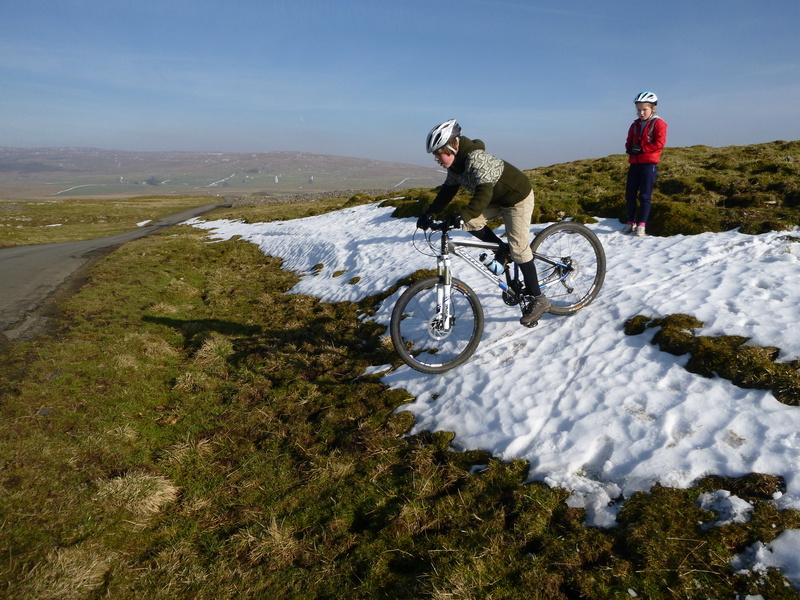 From the pub we rode north a little way into Littondale, then back over a route high enough for snow still deep in places. All up of course it’s great to introduce to our kids, and see again for ourselves, parts of the world we know and love, via the two modes of mobility – walking and cycling – which make that world so precious and special. But both Sue and I were struck last week by how hard British cycle-touring as a family might prove to be: it’s not that our kids aren’t competent riders – they are; we’re just unsure whether the stress of shepherding them along roads on which so many anti-cycling motorists drive is conducive to relaxation. I’d thought our continental cycle-touring of the past decade would make way for more domestic cycle-touring over the next, but I’m now less sure. 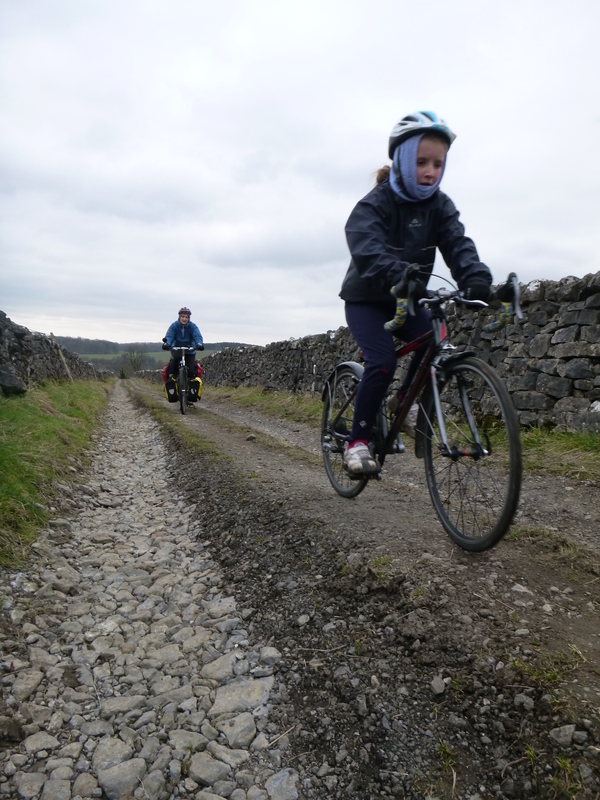 It’s a shame to think the roads through the magnificent countryside of northern England might be off-limits to my kids, that they might be denied the pleasures of rural cycling. But then many of the roads round town, within a stone’s throw of home, are off-limits too. Whichever’s the greater, both seem like crimes to me. And then I think how the thousands of children lining Yorkshire’s roads to cheer two hundred cyclists next July don’t have the chance to travel their own backyard on two wheels, to experience this magnificent world from the seat of a bicycle, and it seems not a crime but a tragedy. 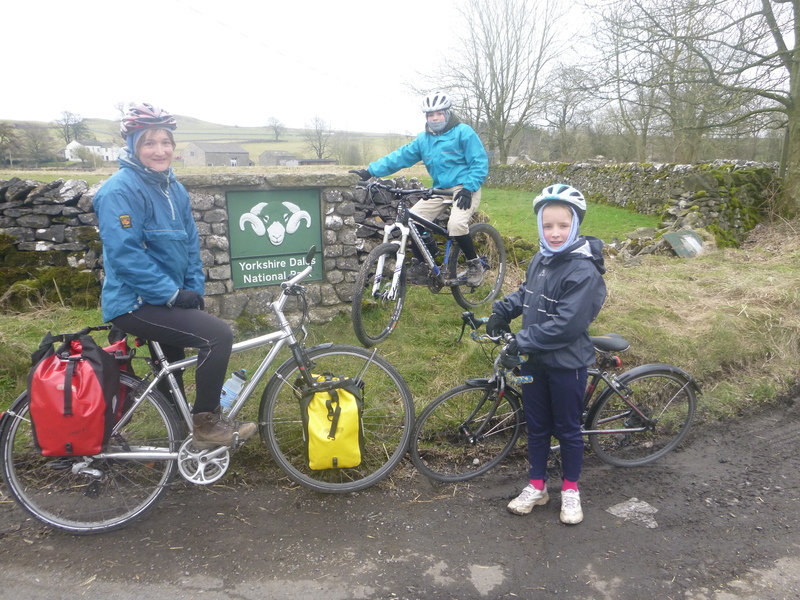 Leaving Malham, following the River Aire towards Gargrave, we took a stretch of National Cycle Network Route 68. 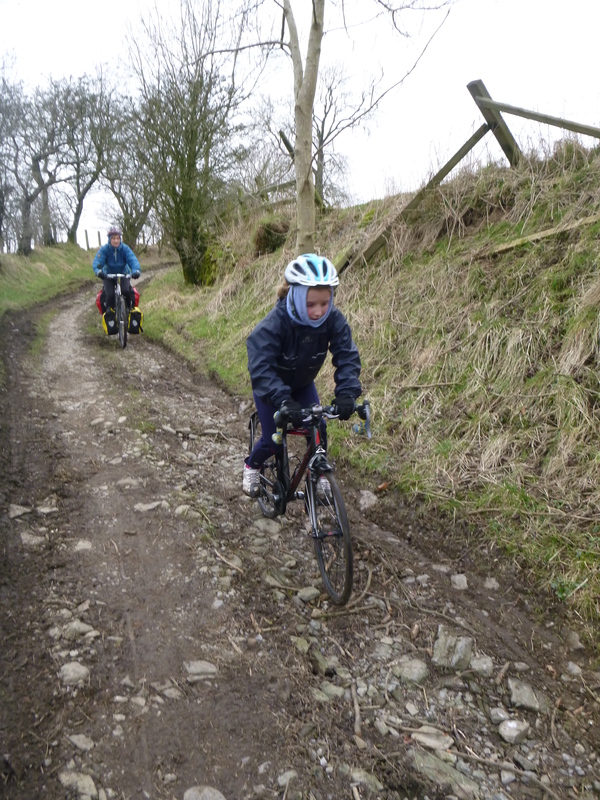 On her little road bike Flo again coped magnificently, this time with mud, puddles, rocks and stones. But what sort of alternative to being harassed by cars is this? I’d hazard one more likely to drive most nine-year olds to tears than to a love of cycling. Sorry to be bleak. We had a fantastic holiday! I guess I’m just sharing the realisation that the Tour de France coming to Yorkshire next year will be great for cycle sport and great for Yorkshire’s tourist industry but, unless we get our acts together, it’s unlikely to be great something that matters far more, cycling. Winter’s ending. It’s doing so uncertainly, as it always does, but there’s now sometimes warmth to the sun and daily the days grow longer. I’ll be able to appreciate one of my deep loves of winter cycling – naked trees – for some time yet, but signs of spring – such as the snowdrops – are emerging elsewhere. Over the last couple of months the highest roads in this corner of the world have often been too treacherous to tackle. While down below there might be none, climb above a few hundred metres and there can be ice, sometimes in sheets across the road where the rain running off the moors has temporarily frozen to a halt. So last week’s mild spell saw me raise my cycling horizon and ride over Cross o’Greet for the first time in a while. 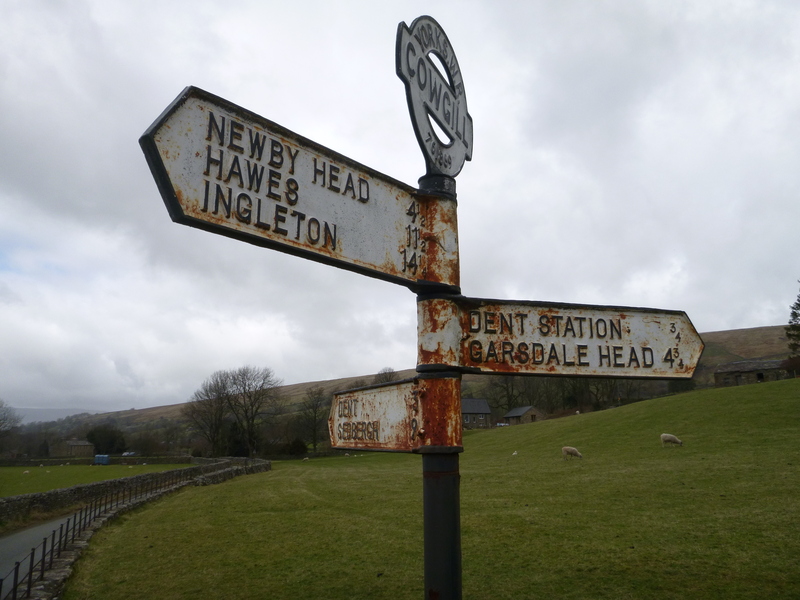 At 427 metres you pass – if heading south – from the Yorkshire Dales into the Forest of Bowland. 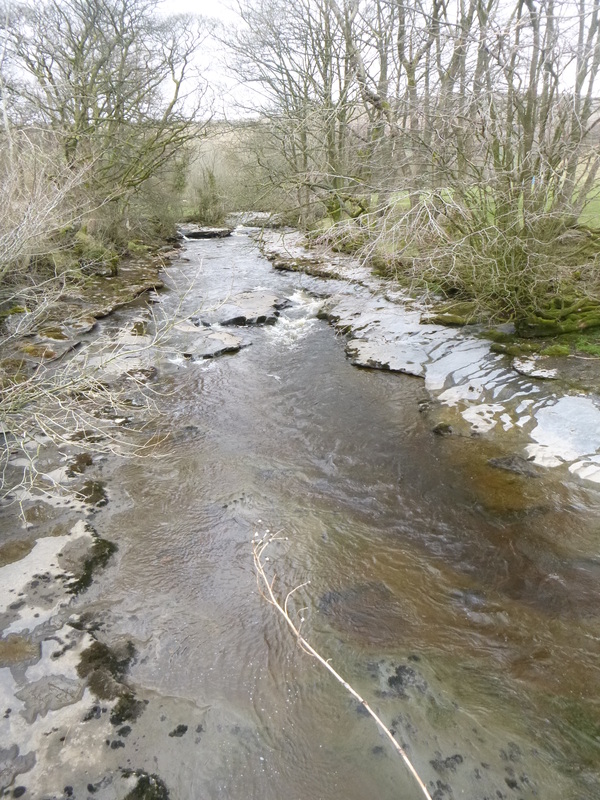 At Slaidburn I typically turn west, returning to Lancaster through the Trough of Bowland, but last week I continued another ten miles south to Clitheroe, a place which – despite being little more than 30 miles distant – I’m ashamed to say I’d never been before. I wanted to visit The Green Jersey cafe, which has just opened there. 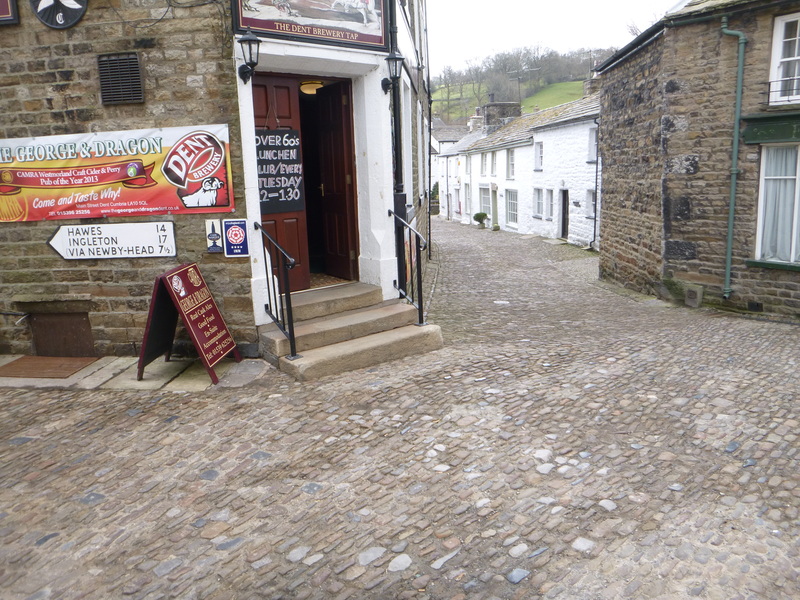 The cafe’s situated in the town but also right at the foot of Pendle Hill, classic cycling country. A big group of riders was just leaving as I arrived at midday. Richard, the owner, isn’t serving food during the week, and only cakes at weekends – but he’ll look to change that if the demand is there. I think it might be. In the meantime, he’s serving damn fine coffee and you can top up on flapjacks, energy bars and gels, and help yourself to bananas in exchange for a deposit in the honesty box. It’s these little touches which make The Green Jersey feel such a treat: a collection of classy cycling books and magazines spread across the long central table, to browse as you relax; the knowledge that you’re being served by a fellow cyclist, so filling up your water bottle isn’t going to be a problem, that there are spares should you need them. If you will forgive my being momentarily sociological, it’s a place where one’s cycling identity can be announced and is appreciated and affirmed rather than – as can sometimes happen – merely tolerated. I recognised Richard – he ran a bike shop in Lancaster a few years back. He’s a man who lives and breathes the cycle trade and he knows how it’s changing. Small bike shops are struggling to compete with the big on-line retailers, and they need to offer something different. A place to visit during a ride, or a base from which to start a ride, is an obvious response. The Green Jersey is not just a bike shop, and it’s not just a cafe. It’s both, and much more, and potentially even more than that (by which I mean that such places will become in part what we as their customers choose to make (of) them). Richard has an admirable spirit of adventure and openness to the possibilities ahead. He has plans for courses and events – anything, I think, which simultaneously gives him business whilst responding to potential needs and desires out there. He wants it to be a place which matters to people locally, as well as a place which draws in people from further afield. The place has a cycling ethos. Such places are helping to make cycling happen, and they need cycling to happen to help them thrive. Richard is an entrepreneur, betting on cycling’s growth. Such entrepreneurship creates the conditions through which cycling can grow. The Green Jersey is less a shop or cafe than a venue; its ethos is I think similar to that behind Look Mum No Hands in London; it’s an ethos which – as Richard himself noted – Mud Dock pioneered, many years ago now, in Bristol. Such places are ‘cycling hubs’ – places to cycle, to watch cycling, to talk cycling, to acquire cycling, to learn cycling – to do all the kinds of work which are required to move cycling to a place of greater centrality, both in our own lives, and also in our culture as a whole. The Green Jersey was officially opened by the President of British Cycling Brian Cookson, and by cycling legend Graeme Obree just a few weeks ago (not bad friends to have, eh?!) It’s a really super place, a splendid place to break, or start/finish a ride, and I wish Richard and all concerned all the very best. I’ll certainly be returning, and other local businesses please take note, it’s put Clitheroe firmly on my map as a lovely place full of character and worthy of a longer visit. For those of us committed to transitioning our world towards low-carbon and convivial, human-scaled sustainability, we need a broad and deep bicycle system. As such, any place which is hospitable to bicycles, cycling and cyclists not only deserves but actually demands our support. Come on, there’s no better justification for a coffee and a flick of the latest issue of Rouleur! Is there something about rising expectations and surging ambitions associated with this time of year – the tentative end of winter making way for the slow dawn of spring? Certainly, there’s real optimism in the air for British cycling – it’s apparent in the immediate response to The Times’ ‘Cities Fit for Cycling’ campaign, in last week’s Parliamentary debate on cycling and its future, and in London Cycling Campaign’s current ‘Love London, Go Dutch’ campaign; it’s apparent too, in patriotic (but not I think parochial) hopes for major British success in cycle sport – not just at the Olympics but also at the Tour, and just maybe the Classics too. This ‘optimistic, spring is in the air’ feel is also apparent locally. An event marking the arrival of the ‘road racing year’ in this part of the world is the Coal Road Challenge, organised by Lune Racing Cycling Club. It took place yesterday, another mild and slightly damp day. It’s a super ride into the Yorkshire Dales: out through Wray, the Benthams and Ingleton; up past Chapel-le-Dale and Ribblehead to Newby Head Moss and then down into Hawes; west to Garsdale Head and the long hard climb over to Dentdale via ‘the Coal Road’, which reaches 537 metres; and then the Dent cobbles and the stiff climb over to Barbondale before the final ‘home run’ west along Lunesdale. There were far more people riding than I’d expected. This big turn out is I think a sign of cycling’s continuing renaissance here. Whilst London is getting the lion’s share of attention, there are positive signs for cycling elsewhere, including up here in England’s north-west. Wherever we are, let’s work towards a truly great year for cycling. I love the weather in north-west England, and the last two weekends I’ve been lucky enough to experience it in all its magnificent diversity. 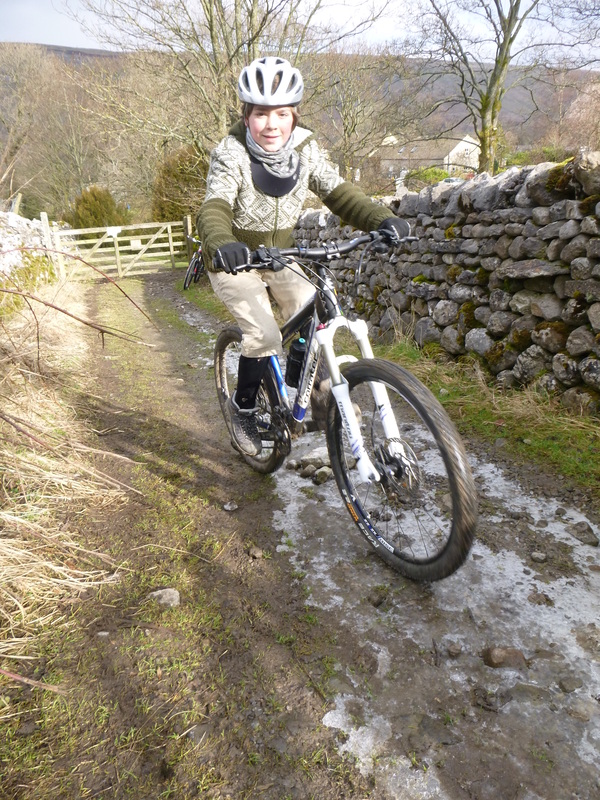 Last Sunday we rode from Wharfedale over to Bishopdale and then west through Wensleydale for coffee in Bainbridge. 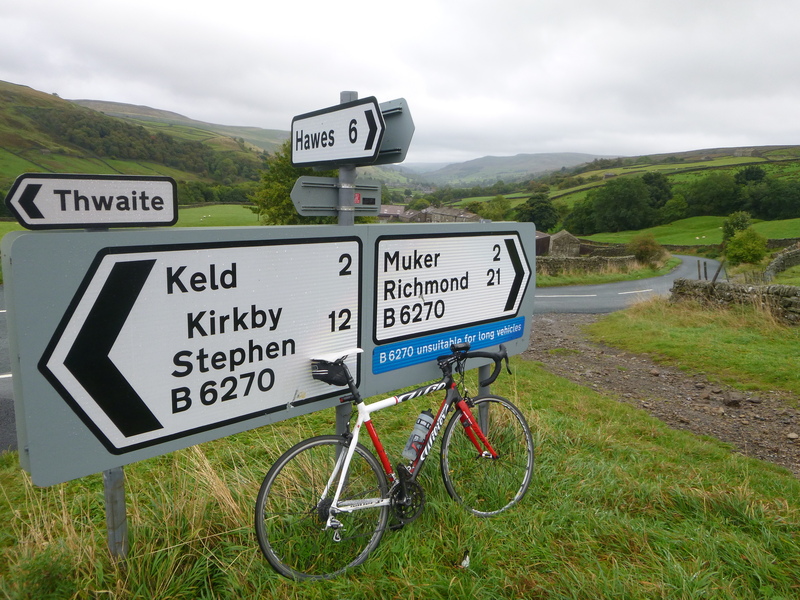 We crossed the valley to Askrigg and climbed over Cross Top to Muker in Swaledale. North-west from there, over Birkdale Common and then the long descent into Nateby, for a generous welcome and lunch at the Black Bull Inn, where Jim showed me how to dry your track mitts by treading them into a carpet, and where I hope no one had to sit where we sat for a good few hours after … South up the ever-beautiful Mallerstang, then fast west down the always-pleasureable Garsdale into Sedbergh, where, having checked the cafe’s seats were wooden and immune to saturation by our sodden clothes, we enjoyed afternoon tea. Down Garsdale the rain had become much heavier, and it continued as we rode south along the west side of our Lune towards Kirkby Lonsdale, and on for tea at the Bridge Inn. There the four of us squeezed into the gents’ toilets, and emerged in dry clothes like new men to devour our tea and drink our beer before, late into the night, setting off again to get one final drenching along flooded roads on our way back home to our beds. 90 miles, a couple of thousand metres of climbing, huge amounts of rain – the kind of day which makes me glad to be alive and able to enjoy that kind of day. If I’d been at home last Sunday, I’d have probably on several occasions looked out the window and failed to find the motivation to get outside. No matter how exhilarating cycling through difficult conditions can be, it’s still hard to force yourself out there to do it. Comfort too often, too easily, wins out over the potential to feel exhilarated. This weekend was different. The forecast was dry for Saturday, and – with Bobby and Flo happily off with Sue, Paddy, Ben and Rachel for the weekend – Sue and I pedalled north through the Yealands, over the River Kent, around Whitbarrow and up the gorgeous Winster valley, to drop down to Bowness-on-Windermere a few very happy hours later. Yesterday we took the ferry across Windermere and rode up through the Sawreys and down to Esthwaite Water, before riding south into another little south lakeland gem of a valley, the Rusland. The sun continued to shine, and we arrived home after 2 days and 100 miles pedalling through north-west September England as dry as we had left. The dryness of the weekend was all the more enjoyable because of the previous weekend’s damp, and the dampness of that weekend stands out because such dampness is not entirely typical. Here in autumnal north-west England there is no typical, and the uneven climate combines with the uneven topography to produce an extra-special slice of the cycling universe. I spent a long weekend with some of the Monday nighters, doing some hard riding around the north of England. On Friday we rode from Lancaster to Nenthead, high in the Pennines, via Kirkby Lonsdale, Sedbergh, Appleby-in-Westmorland and Hartside. On Sunday we rode from Brompton-in-Swale, just to the east of Richmond, back home to Lancaster, via Redmire, Coverdale, Littondale and our usual last resting post, The Bridge Inn near Wennington. The sun shone on us, mainly, on Sunday. 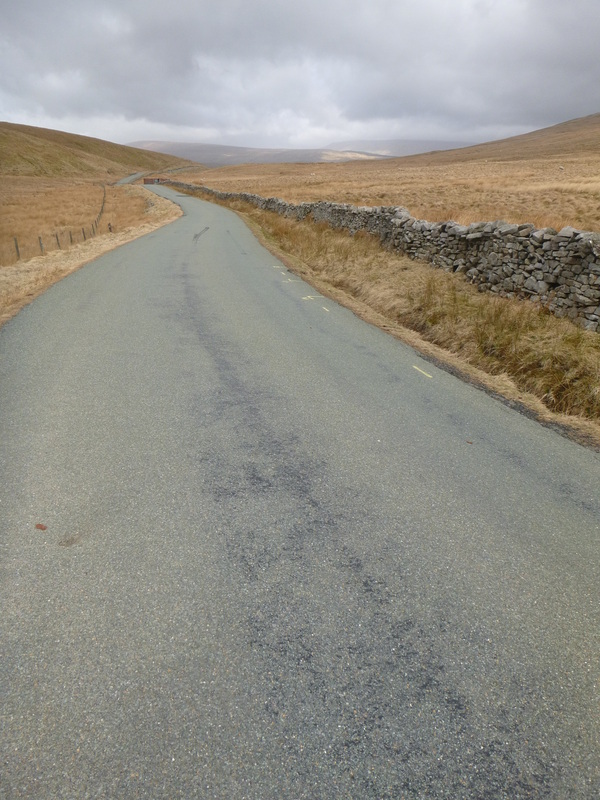 Here’s a stretch of road which runs along the south-east base of Pen-y-ghent, connecting Halton Gill and Stainforth. 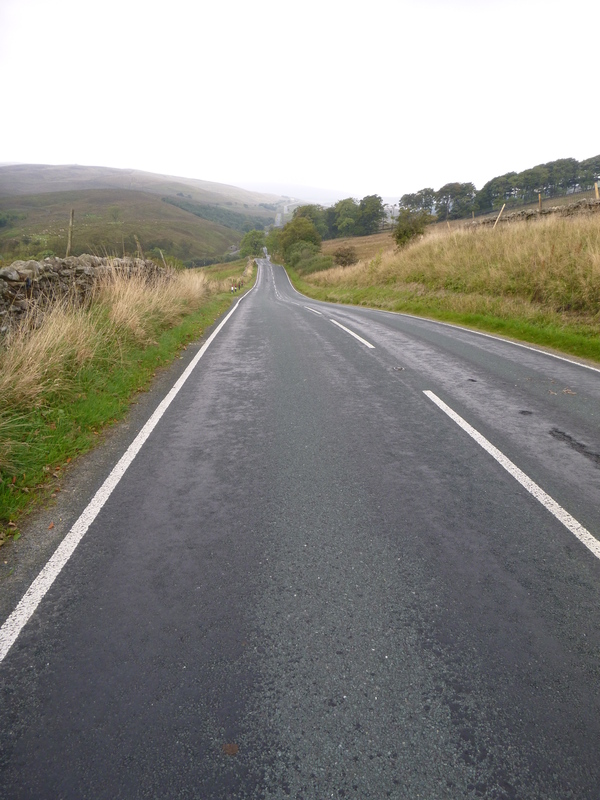 As you can see, we’ve got some pretty good cycling infrastructure in the Yorkshire Dales. And here’s Colin and me consulting the map, with Pen-y-ghent looming behind. So we had plenty of hills. But it’s Saturday’s ride, when we also had the wind to contend with, on which I want to concentrate, briefly, here. We began the day riding north through Allendale, towards Hadrian’s Wall. Then Jules turned west, to Brampton and into the teeth of a strengthening gale, whilst Colin, John and I flew east past Hexham before veering south to Blanchland. I nipped into the village shop for flapjack there, and asked the storekeeper if she knew what the wind would be doing. 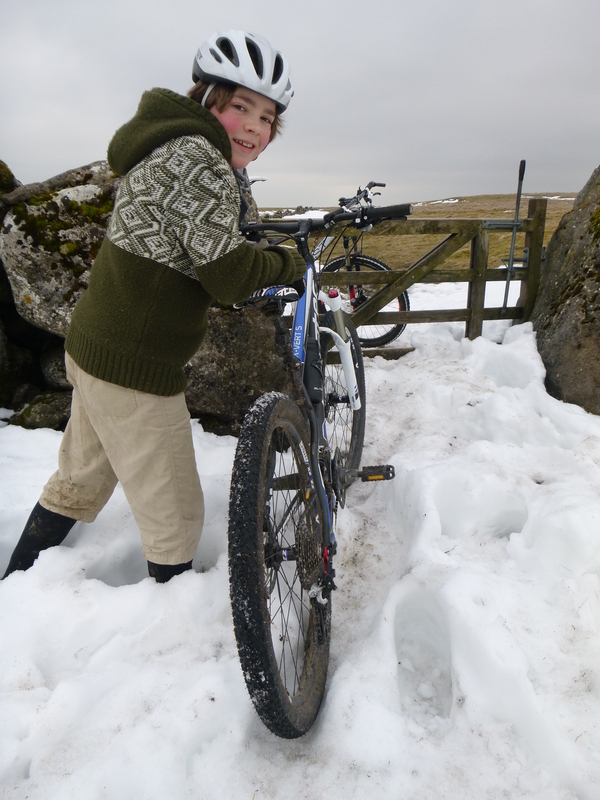 “Getting stronger this afternoon”, she told me, “you’re not going up are you?” We were, over the moors to Stanhope. As we began the climb we had some shelter. But as we climbed higher there was no escape from the wind. Towards the top, out on the moor, we were riding on the right-hand side of the road, so that when the wind took us, we had the road’s width in which to steady ourselves and remain upright. There was so little traffic, this was a sensible strategy. Over the top and down the other side we accelerated into trouble. I could feel the wind lifting my wheels from the ground. It kept pushing me off the road, into the verge. John came past me, his body and bike tilted towards the wind, so he was riding at about 70 degrees to the tarmac. I entered a space of complete concentration. Not flow, I felt far too inept and clumsy for that. But I became completely preoccupied with battling the wind, and somehow making it through. The next time I left the road I looked behind to see a car stopped alongside Colin, who was on the ground. I saw him struggling to his feet, then getting knocked back down again. From where I was, it looked like some kind of surreal comedy, so insanely slapstick that I could imagine it being a Laurel and Hardy sketch. Not silent of course, the wind roared. The wind, it has to be said, was just magnificent. I tried walking back up the hill with my bike. Impossible. I dumped it in the ditch, and struggled back up to him. If we stood close and shouted, we could just about make ourselves heard before the wind ripped our voices away. He’d pulled over to let the car pass, which had left him with no room for manoeuvre. He’d gone head first over the handlebars, and the bike had landed on top of him. The couple in the car were concerned that he was OK. He was, but I think the incident had completed dented what little faith he may have had remaining in his ability to get down to the valley by bike. I continued down, and reached the junction with the Edmundbyers-Stanhope road. There was more car traffic along here. Some of the drivers were very good – they were able to see, and respond appropriately to, the difficulties we were having. Others drove atrociously. Later Colin told me how one driver passing him blared his horn, gesticulated wildly, and mouthed obscenities. I guess, from where he sat, and without an ounce of empathy or solidarity with the cyclist’s condition, it looked like we were holding him up. I guess, in a bizarre and rather ineffective way, we were trying particularly hard to assert our right to the road. I developed a riding style (using that term loosely) that seemed to work. It involved desperately clinging onto my bike, with one foot clipped in and the other dangling near the ground, so I was ready to dismount every time I left the road. A little further down, John was waiting. I told him that Colin had crashed, but was OK. John went back up to look for him. By now it had become a very weird drama, three men (as well as two mountain bikers, who I saw briefly, storm-blown statues frozen into the landscape, looking for all the world as though they were completely unable to proceed) stumbling slowly down off a mountain, seeking sanctuary in the valley below, a valley which seemed almost impossible to reach. But finally I got down to a cattle-grid, where I sheltered in the lee of a farm-house, and waited for the others to arrive. Maybe five minutes passed. A car pulled up. The woman inside told me she’d taken Colin down to Stanhope, and had come back to see if either John or I needed help. A good samaritan! Suddenly the drivers who had passed too close and too fast, seemingly oblivious to our predicament, were trumped in my mind by a single person who’d been willing to help. Colin told me later that she stopped when she saw him lying beside the road, completely exhausted and devoid of a strategy for how to continue. He’d tried to stand up with his bike, his bike had been flipped into the air, he’d been knocked over and his bike had landed on top of him … This lightweight gear’s not all it’s cracked up to be, eh? John and I had survived the hard bit, so were happy to ride the rest of the way down to Stanhope. What a contrast there! Stanhope’s a lovely little town, full of fine stone buildings. At lunchtime on Saturday it seemed outrageously calm, dignified, impervious to the elements. Entering the cafe on Stanhope high street was even more surreal. Everything, everybody seemed normal, as if nothing had happened, which of course, for them, it hadn’t. It was like one of those non-stop adventure films where the action suddenly, rudely enters into other people’s everyday lives, destabilising business-as-usual and producing comedy out of the contrast between the intense pace of the action and the stillness of everything else. Couples were sitting quietly, sipping tea from old-fashioned cups which sat elegantly on their saucers. The civility of the tea-room forced us to compose ourselves, but still we must have seemed raucous, rowdy and ever-so-slightly wild. Wind is seen as a barrier to cycling. But it is also massively constitutive of our cycling experiences. What we cannot avoid, we encounter, experience and embody. The wind makes us, as cyclists, as people who experience the world differently because we ride bikes. If you ride a bike you know how powerful the wind can be. You sit on a bike. On a bike you’re exposed. In contrast, you inhabit a car, you’re enclosed, sheltered, including from the elements, including from the wind. I think we should celebrate this difference. 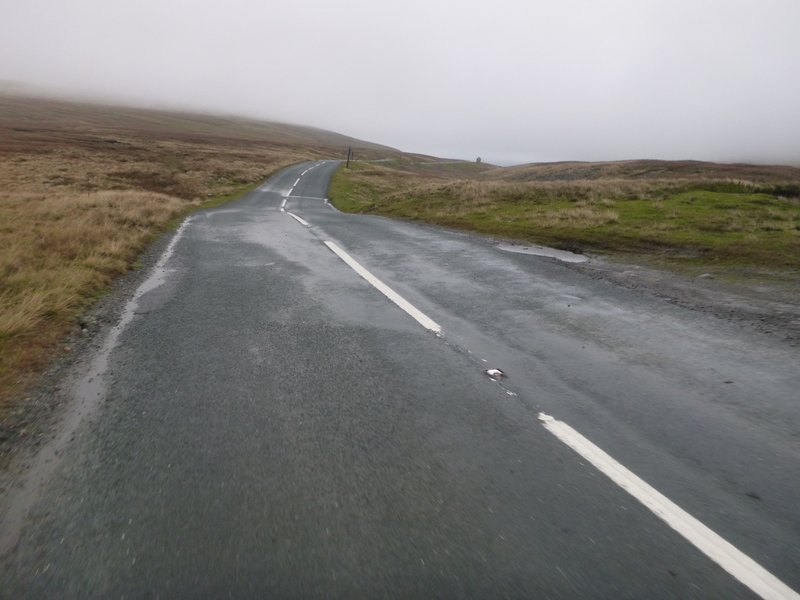 Admittedly, our experience up in the Pennines on Saturday was a bit extreme, but in general I struggle to understand why we should see the way cycling exposes you to the elements, including the wind, as a problem. Riding in the wind can be hard. But it can also be inspiring. It’s also inevitable. We should see cycling as a way of making ourselves stronger, better people, and thus of making stronger, better cultures. As with wind, so with some of the other so-called ‘barriers to cycling’, such as hills and rain. People who want to eliminate these ‘barriers to cycling’ want to fit cycling into the world-as-it-is, they want to bend cycling into an imperfect world, they want to make cycling ‘perfect’ so it can sustain imperfection. That’s so wrong. I’d rather people deal with, experience and perhaps learn the pleasures of these ‘barriers to cycling’, so that by cycling they contribute to the world-as-it-ought-to-be. This week Sue and I had one of our occasional (maybe two or three times a year) overnight cycle trips. Bobby and Flo went off happily to visit their friends, Rosie, Hamish and Nancy, for the night (thanks Abi and John! ), and we rode pretty much due east for about 40 miles, to the tiny village of Litton, just north of Malham in the Yorkshire Dales. Once you get to Wray, 10 miles north-east of Lancaster, the back lane all the way to Austwick is pure bliss – narrow, quiet and with few hills to distract you from the magnificent views it affords to the north. At Austwick we took a little lane over to Ribblesdale, then went south to Stainforth, and then on to the climb in the shadow of the darkly majestic (on Tuesday, anyway) Pen-y-ghent over to Halton Gill. Halton Gill sits at the apex of two roads, one coming from Stainforth and Ribblesdale to the south-west, the other from Kettlewell and Wharfedale to the south-east. I’d never ridden either, although I’d often looked longingly at them on the map, thinking what wonderful cycling roads they must be. And indeed they are. 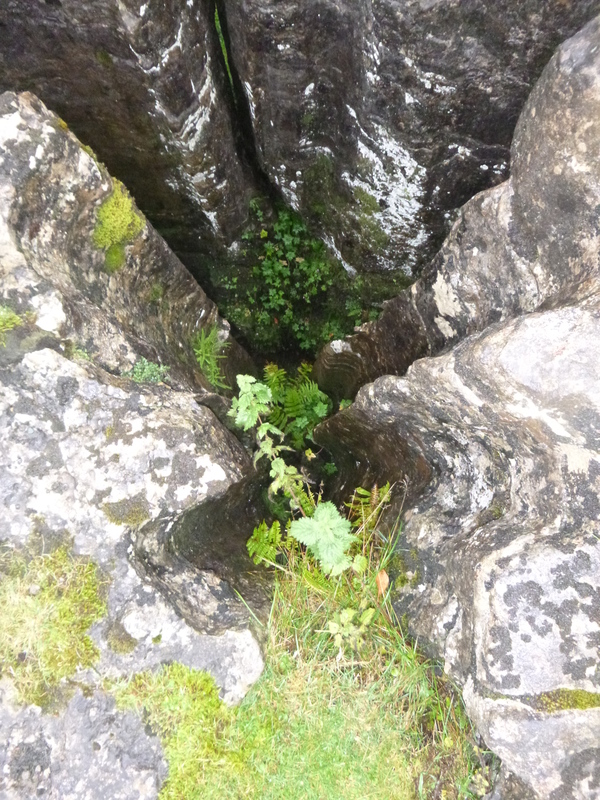 The climb out of Stainforth is never severe, but takes you to 400 metres and along the base of Pen-y-ghent. The drop down to Halton Gill gave us gorgeous views of Littondale. We turned left at the bottom, to go to the road end at Foxup, just so we’d been there (Sue just about manages to indulge this personal trait of mine, and actually we discovered a nice-looking bunk house along here, which’d make a good base for some future trip). Then a couple of miles along the flat valley bottom to Litton, and The Queen’s Arms, which is also home to the Littondale micro-brewery. Good beer, and a good place to spend the night. I’d thought we might return around the south of the Forest of Bowland, via Hellifield, Bolton-by-Bowland and the Trough. but the weather forecast was atrocious – stair-rod rain and floods. So we opted to return the quicker way, as we’d come. As so often seems to happen (these days? ), the threatened downpour didn’t really materialise, and we had a lovely return ride, stopping off at Wray for lunch (the day before it had been The New Inn for the ‘credit-crunch busting deal’ of 2 lunches for £6; today it was Bridge House Cafe for a 2 course lunch (which we shared, along with a soup) for £6.50). 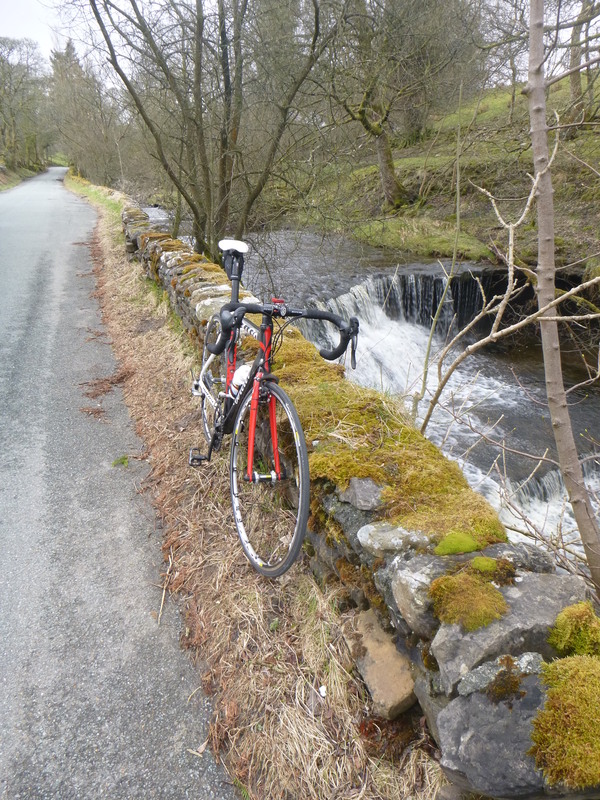 Lovely, at this time of year, to get a bit further into the Dales than an easy day ride really allows. And we still haven’t run out of new places and roads to explore.